The great success of "Madam Butterfly" is not difficult to understand. To begin with, the libretto is exceptionally strong; unlike most opera "books," it would have made a powerful drama without music. The authors have treated in masterly fashion a story which, in its original form, possessed no special merit; they have transformed Belascos adaptation of an ordinary tale into a compact play of engrossing interest and infinite pathos. The dramatic action, of paramount importance, is swift and inevitable. The general gaiety of the first Act presents the necessary contrast to the gloom of the later scenes, which gradually deepens as the tragedy draws near. The characters are boldly drawn, and have well-defined personalities; the dialogue is clever and to the point; and the language of the love passages is highly poetical and very vocal. Local colour and all details are utilised in a most artistic way to make the heroine stand out -- a picturesque, pathetic figure, commanding admiration, love, and sympathy. Nothing interferes with, everything adds to, the main interest of the work -- the fate of that quaint, fascinating Geisha, the loving, lovable, heroic little Butterfly. No wonder the "book" proved an inspiration to the composer. 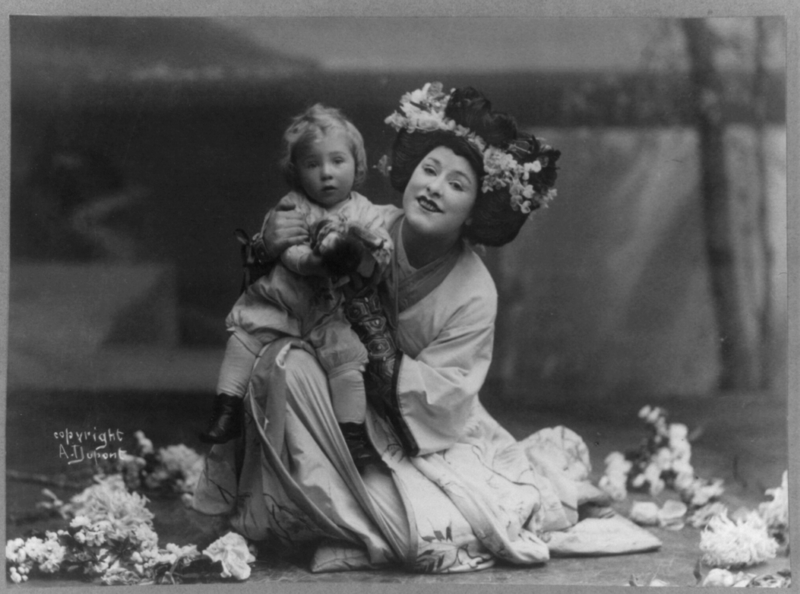 Soprano opera singer, Geraldine Farrar (1882-1967), full length, kneeling child on knee, in Puccini's opera, Madame Butterfly. Date of photo: 31 March 1908. ACT 1. -- The curtain rises on a Japanese house, with its terrace and garden. Below, in the background, are the bay, harbour, and town of Nagasaki. From a back-room Goro, the marriage-broker, leads in Pinkerton obsequiously, drawing his attention to the details of the structure. They go down into the garden, and the servants whom Goro has engaged for the household are introduced to their new master. Then the broker, while keeping a look-out for the bride and her party, enumerates the expected guests. The first to arrive is Sharpless, the American Consul, breathless after climbing the steep ascent to the house. Pinkerton, having ordered refreshments, discusses the beautiful view with his friend, and tells him that he has bought this picturesque dwelling for 999 years, with the option of canceling the contract every month. Inviting Sharpless to be seated, he gives him a taste of his philosophy in a characteristic song. "The whole world over, on business and pleasure, the Yankee travels all danger scorning. His anchor boldly he casts at random, until a sudden squall upsets his ship, then up go sails and rigging. And life is not worth living if he cant win the best and fairest of each country, and the heart of each maid." Acting on this theory, he is now marrying in Japanese fashion, tied for 999 years, yet free to annul the marriage monthly. Sharpless interrupts the song to remark that this is "an easy gospel which makes life very pleasant, but is fatal in the end." The Lieutenant, however, pays no attention to his friends warning. He goes on to explain how he has been fascinated by the quaint little girl, who "seems to have stepped down straight from a screen," and who is so like her namesake the butterfly, that a wild wish had seized him to rush after her, "though in the quest her frail wings should be broken." The Consul has not yet seen the bride, but he has heard her speak, and her voice has touched his soul. "Surely," he says, "love that is pure and true speaks like that. It were indeed sad pity to tear those dainty wings and perhaps torment a trusting heart." The Lieutenant nevertheless will not allow that any harm can come to Butterfly through him. Raising his glass, Sharpless drinks to friends and relations at home; Pinkerton, showing how far from seriously he takes this love affair, drinks to the day on which he will wed "in real marriage, a real wife from America." At this moment the bridal party are heard singing in the distance. As they approach, praising the beauty of the surrounding scene, the bridges voice is added to the chorus, in strains expressing her joy at standing on the threshold of love. At last she appears on the stage with her girl friends, all carrying large, bright-coloured sunshades, and making a very pretty picture. After the exchange of greetings, Sharpless inquiries if the bride comes from Nagasaki. In reply she tells him the story of her life. She was rich at one time but, becoming poor, had to go as a Geisha to earn her living. Her mother is still alive; her father, alas, is dead; one uncle is the Bonze, a miracle of wisdom; the other, Yakuside, is a perpetual tippler. Then with childish coquetry she makes the Consul guess her age. She is fifteen, "the age of plaything and sweetmeats." Presently Goro announces new arrivals -- the august High Commissioner, the Official Registrar, and the relatives. The bride and her girl friends receive the quaint group, while Pinkerton, taking Sharpless to one side, laughingly remarks: "What a farce is this procession of my worthy new relations, held on terms of monthly contract!" Butterfly now points out the bridegroom to her kinsfolk, who in turn proceed to criticise Pinkertons looks with great candour. Most of them think him handsome, a few have a different opinion. At this stage the Consul examines the papers for the contract. Pinkerton, meanwhile, approaching Butterfly, finds her rather embarrassed. She is drawing from her sleeves the few treasures she had not wished to part with on entering on her new life -- silken kerchiefs, a coloured ribbon, a little silver buckle, a mirror, a fan, and a tiny jar of carmine. Her most sacred possession, a long narrow sheath, she lays down reverently. This, Goro whispers, was sent by the Mikado to her father with a command, which he obeyed -- and the broker imitates the action of suicide. Last of all, Butterfly takes some images from her sleeves, the souls of her forefathers, the "Ottokè." In confidential tones she tells her lover that, for his sake, and unknown to her family, she has been to the mission, abjured her own religion, and adopted his. To give him more pleasure, she can almost forget her race and kindred. "Away they go," she cries, throwing down the Ottokè, just as Goro approaches Sharpless and having received the Consuls orders shouts "Silence!" The chattering ceases, they all leave off eating and drinking, and coming forward in a circle, in the center of which stand the bride and bridegroom, they listen with much interest to the wedding ceremony, performed by the Commissioner. After the signing of the papers, the friends congratulate Butterfly, and the function is over. The Commissioner, the Registrar, and Sharpless take their leave together, but the Consul turns back for a moment to again warn his friend to be careful. Pinkerton reassures him, and waving his hand from the background, returns to the front, to get rid of the family party as quickly as possible. He plies them with cakes and wine, and they are all drinking the health of the newly married couple, when suddenly strange cries are heard coming from the path on the hill; the tam-tam sounds from the distance, and the voice of the Bonze shouts, "Cho-cho-san! Abomination!" The guests are awestruck and huddle together in terror. In the background there appears the odd figure of the Buddhist priest. At sight of Butterfly he stretches out his hands menacingly. "What were you doing at the mission?" he cries, and receiving no answer, informs the party: "She has renounced her true religion, she has renounced us all!" He approaches his niece in a fury, and hurls imprecations at the poor girl till Pinkerton loses patience, and intervening between the priest and the bride, loudly bids him hold his peace and begone. The relatives join the Bonze in denouncing Butterfly, and as they retire, their curses are heard for some tine growing faint in the distance. Butterfly, thoroughly upset by this scene, bursts into tears, and her husband, who has watched the departure of his guests from the back, hastens forward to comfort her. Just then Butterflys maid, Suzuki, is heard within at her evening prayer, and the lovers move towards the house. The servants close the shosi; Suzuki assists her mistress to change her wedding dress for one of pure white; and at last the bride and bridegroom are left alone. While Butterfly arranges her hair, Pinkerton watches her and soliloquises on her graceful prettiness and alluring charm. Presently he leads her to the terrace. And now they breathe out their mutual devotion mid the beauties of an Eastern night, willingly yielding themselves to the passionate influence of the heaven and earth around them, of which they feel themselves a part. Twice during this exquisite love scene, Butterfly is disturbed by thoughts of the anathemas of her people, only to be reassured by the protestations of her husband, whom she has for the time being completely fascinated by her innocent charm. She naively confesses she had not wished to marry him when his offer first came to her through the marriage-broker, but she loved him whenever she saw him, and now he is all the world to her, now she is perfectly happy. Very pathetic is her prayer: "Ah, love me a little, just a very little, as you would love a baby; tis all that I ask for. I come of a people accustomed to little; grateful for love thats silent, light as a blossom, and yet everlasting as the sky, as the fathomless ocean." When Pinkerton calls her his butterfly, her face clouds over, and she reminds him: "They say that in your country, if a butterfly is caught by a man, hell pierce its heart with a needle and leave it to perish." Her lovers embrace, however, chases away the painful thought, and gazing at the starlit sky they join in praising the glory of the night, pouring out their rapture on the sleeping world around. Pinkerton leads his bride from the garden into the house, and the curtain falls on a scene full of poetry, charm, and passion. ACT 2, FIRST PART. -- Three years have passed when the curtain rises again on the interior of Butterflys house. Suzuki, coiled up before the image of Buddha, is praying, and from time to time she rings the prayer-bell to invoke the attention of the gods. Butterfly is standing rigid and motionless near a screen. At last the maid goes to a small cabinet, and opening a casket, shows her mistress a very few coins. Unless her husband comes back quickly they are in a sad plight. Suzuki has little faith in Pinkertons home-coming after so long an absence. This provokes Butterflys anger, and to warrant her belief in her husband, she quotes his last promise to her, to "return with the roses, the warm and sunny season, when the redbreasted robins are busy nesting." Then she prettily depicts his arrival, acting the scene as though it were really taking place. She has scarcely recovered from the entrancement of this beautiful day-dream when Goro and Sharpless appear in the garden. The consul enters to the great joy of Butterfly. Anxious to explain the object of his visit, he produces a letter which he tells her is from Pinkerton. "Then Im the happiest woman in Japan," she exclaims; yet before she will hear it, she must ask a question: "At what time of the year do the robins nest in America?" In Japan they have built thrice already since her husbands departure. In America perhaps they may build more rarely? Goro, who has been listening on the terrace, bursts out laughing. Sharpless, in a confused manner, declares that he has not studied ornithology. He tries to reopen the subject of the letter, but Goros presence reminds Butterfly to inform the Consul that her husband was scarcely gone before the broker endeavoured to induce her to marry again; that he had offered her half-a-dozen suitors, and now wishes her to wed a wealthy idiot, Prince Yamadori. Just then the Prince is seen on the terrace. He enters with great pomp, greets the Consuls, bows most graciously to Butterfly, and sits down between them. Although she makes fun of him and teases him unmercifully, Yamadori is ready to swear eternal faith to the charming Butterfly. The devoted little woman, however, insists that she is still Pinkertons wife, and therefore cannot wed another. To put an end to discussion she pours out tea for her guests. Goro, meanwhile, whispers to Sharpless that the Lieutenants ship is already signalled. The Consul is in despair as to how he is to deliver his message, when Yamadori, rising, takes a sorrowful farewell of Butterfly, who laughs behind her fan at his grotesque figure in the throes of love. Goro follows the Prince. At last Sharpless manages to begin the reading of the letter. Many times he is interrupted by the excited girl; and she is so convinced of Pinkertons loyalty that the Consul has not the heart to tell her plainly what she must expect. Instead of finishing the letter, he asks her what she would do were she never to see her husband again. The poor soul, looking as if she had received a death-blow, stammers out: "Two things I might do: go back and entertain the people with my songs, or else better to die." Sharpless is deeply moved. He is loath indeed to destroy her illusion, but he urges her to accept the wealthy Yamadori. Coming from one she had thought of as her husbands friend and her own, this suggestion wounds her cruelly. She is nearly fainting, when she suddenly revives, and running out of the room, returns triumphantly carrying her baby on her shoulder -- the son that had been born after Pinkertons departure. In a highly dramatic song to the child she describes how she may yet have to take him in her arms and sing and dance in the street to earn a living. In her imagination she pictures the boy being noticed by the Emperor, who will ultimately make him "the most exalted ruler of his kingdom." Sharpless, conquering his emotion, inquires the babys name and receives this reply from Butterfly, who with childlike grace addresses her son: "Give answer -- Sir, my name now is Trouble, but yet write and tell my father that on the day of his returning, Joy shall be my name." The Consul promises that the father shall be told, and takes his leave. In a few minutes Suzuki enters, dragging in Goro. The despicable creatre has been spreading the scandal all through the town that no one knows who is this babys father. Butterfly is furious, and seizing the dagger that hangs by the shrine, she threatens to kill the broker. The maid throws herself between them, and carries off the child, while Goro escapes. Suddenly the cannon announces the arrival in the harbour of a man-of-war. Suzuki comes in breathlessly, and both run to the terrace. Butterfly, looking through a telescope, exclaims "The Abraham Lincoln!" (Pinkertons ship), and in a state of excitement reproaches the maid for her want of faith. Immediately they begin to decorate the room with flowers from the garden, at the same time giving vocal expression to their rapture and joyous anticipation of the long-expected meeting. Finally, when the garden has been robbed of every blossom, Suzuki helps to dress her mistress in her wedding garment, and to adorn the baby. Night falls, and the maid closes the shosi, in which Butterfly makes three holes. Beside these they, settle themselves to watch and wait for the wanderers return. The moonbeams light up the shosi from without, and, as the sound of singing comes from the distance, the baby and Suzuki fall asleep. Butterfly remains rigid and motionless. The sounds die away, while the curtain falls. SECOND PART. -- It rises again upon the same scene and situation, though the midnight hours are past and the dawn is at hand. Butterfly is still gazing out into the distance; Suzuki and the child are asleep. The day breaks, and Butterfly, rousing herself, carries the boy upstairs, singing a lullaby on the way. The maid has just had time to open the shosi, when there is a knocking at the door, and presently, to her surprise, Pinkerton and Sharpless enter, very quietly, bidding her not disturb her mistress. Seeing a lady in the garden, she eagerly demands: "Whos that?" After a little hesitation, Sharpless replies: "His wife." The faithful Suzuki is stupefied with grief. The Consul tries to soothe her, and explains that they have come very early in order to see her alone and get her help. While Pinkerton walks about the room in great agitation, noticing the flowers, the image of Buddha, and all the familiar details, Sharpless tells Suzuki that the future of the little one is their first and special thought. If Butterfly will entrust the child to Mrs. Pinkerton, it shall have a mothers care. He persuades her to go to that lady and hear what she has to say. The Lieutenant, while giving his friend some money for Butterfly, confesses his sorrow and remorse for having thoughtlessly caused all this terrible suffering. The Consul now recalls how he had cautioned him not to trifle with the girls affection, and had foretold the end, if he persisted in deceiving her. After biding a sad farewell to the home where he had once known such happiness, and declaring that he will always he haunted by Butterflys reproachful eyes, Pinkerton wrings the Consuls hand and goes out quickly. Mrs. Pinkerton and Suzuki enter from the garden, talking about the child. Butterfly is now heard calling Suzuki from the room above, and, though the maid attempts to prevent her coming down, she will not be hindered. She assumes her husband has arrived and looks for him in every corner; then, seeing the American lady, she seems at last to understand the situation. Mrs. Pinkerton would fain take her hand, but Butterfly decidedly though kindly refuses to be approached. "Neath the blue vault of the sky, there is no happier lady than you are. May you remain so, nor eer be saddened through me. Yet it would please me much that you should tell him that peace will come to me." Thus she addresses the woman who, through no fault of her own, is the cause of her despair. She listens to the others pleading for the child, and solemnly promises that the father shall have his son if he will come to fetch in half-an-hour. Sharpless and the lady withdraw, feeling utterly helpless to console this anguished yet noble spirit. Butterfly, on the point of collapse, gradually rallies, and seeing that it is broad daylight, bids Suzuki draw the curtains, so that he rooms is in almost total darkness. The maid reluctantly leaves her, weeping bitterly. After a few moments Butterfly lifts a white veil from the shrine and throws it over the screen, then taking the dagger from its case, she reads the inscription: "Death with honour is better than life with dishonour!" She is pointing the blade at her throat, when the door opens, showing Suzukis arm pushing in the child. With outstretched hands he runs to his mother, who lets the dagger fall, and almost smothers him with kisses. In a sublime outburst of love and despair she bids farewell to this "adored being." For the sake of the childs future she will take her own life, that he may go away beyond the ocean, and never feel when he is older that his mother forsook him. At last she sets the baby on a stool, and gives him the American flag and a doll to play with, while she gently bandages his eyes. Seizing the dagger she disappears behind the screen. The knife is heard falling. Butterfly emerges with a long white veil around her neck, and tottering, gropes her way towards the boy. She has just enough strength left to embrace him, then sinks by his side. At this moment Pinkerton is heard outside calling "Butterfly," the door is thrown open, and the Lieutenant and Sharpless rush into the room. With a feeble gesture the dying girl points to the child and breathes her last. The Consul takes the little one in his arms, sobbing, Pinkerton falls on his knees, and the curtain descends. The beautiful cover of an early Italian edition of the music and words for Puccini's opera Madama Butterfly (Madame Butterfly). Artist: Leopoldo Metlicovitz. Date: 1904.